Best show of 2012 - it just might be. This is a comedy drama along the lines of hanasaku iroha or anohana. The animation is beautiful. The story is interesting and the characters are loveable. The voice acting is also above par. All of the voice actor's are fairly new starting their work in the last few years. You may recognize Ayase from Oreimo or Haqua from TWGOK as Sawa the girl who lives at the temple. The main character, konatsu, has a role in DogDays and Lagrange. This seems to be a major debut role for the male leads. The story starts you off right away with the main character having a desire which turns into her goal and becomes her dream. She is immediately pitted against her antagonist, one of the teachers. It is very interesting because you know the teacher has good intentions but believes facing a harsh reality is what's best. I too believe in tough love. As of now, only two episodes have aired. Normally I try to be very subjective about reviewing shows. I try to be fair to shows I am not interested in, yet tend to be harsh on shows I like alot. Tari² is my favorite genre. So much anime is flooding the market that you really need to take a minute and sort through them now. After taking the time to sit down and experience this show it immediately left me with a sense of satisfaction. All I can say is, this show is made of nothing but the best. Today was "Very Japanese Day" in my college Japanese 1 class (I know, childish, right?) and I ended up showcasing a pair of Japanese sneakers to try to hide the fact that I am a pretty big otaku, but my classmates made it pretty darn clear; they know I'm an otaku. They were right; no homework means today's a free day for me, so I was really just thinking of the next anime I was going to watch today. A few clicks later, I stumble upon Tari Tari. I think, "what the heck. Wouldn't hurt and I could always pay attention to my games while I watch it." The games didn't happen. Just over five hours later, I finished the series. I think I'll just put what I thought into words. Plot: After being rejected by the vocal club after an unforgettable mishap, Konatsu Miyamoto forms a choir club comprised of her best friend Sawa Okita, aspiring badminton player Taichi Tanaka, Austrian transfer student Atsuhiro Maeda (or "Wien", as they call him), and a student who's entirely given up on music, Wakana Sakai. It's not a very promising group (not speaking critically!) and they stumble across failure after failure, not until Sakai decides to take up music once again and bring the group up-to-par with the vocal club, which tends to belittle them for "playing a game". There's a small issue I have with the plot, and it comes in the form in the question; "where have I seen this before?" It's a pretty generic plot line and shows like this usually start out urging the viewer to throw the cast a pity party, but given the other things that this anime has to offer, I really let this one go. Characters: I'm glad that one of the main cast, let alone the major focus of this anime (or so I'm led to believe) was incredibly timid with music and opening up in general, but progress allowed her to open up and become a key asset to the group. Not like I've never seen an anime like that, but it doesn't happen often. Most characters in anime tend to stay consistent throughout a series, but even the side characters have some kind of change that they experience, even if some of them go through the motions way too quick (which I really disliked, especially with Sakai, who I feel had a rushed development). Otherwise, I did like the characters in this series. They were all likable in their own separate ways, and that's probably what stopped me from simply gaming the night away. Content: As a "slice of life" anime, I'd expect it to be an anime that leaves you feeling great that the ending went well for everyone. I was right that time, but not before some kind of internal and external struggle that all characters face. What I liked especially was the fact that the characters, unlike Anohana which I saw earlier this week, experienced progressive change, and a progressive buildup of emotions. Everyone didn't break down and admit to their emotions right at one key moment, rather, everyone had a problem that was explained and taken care of at different times. +1 for authenticity there. I did read under genre that this is placed under "comedy". While it's not a comical show, it had its moments where I covered my mouth to stop myself from laughing too loud and also had moments where I smiled wholeheartedly. It didn't have too much humor, but that's a good thing. That just meant they didn't go overboard at all, which I know some shows tend to do. I think it's refreshing this way. This anime doesn't offer much along the lines of fan service, and the characters don't have to set their reputation on fire just to make the audience crack a smile here-and-there. There are times when I prefer subtle, dry humor, and there are times when I want to laugh so hard that I cry, but it's a good thing that today, I preferred dry humor. Miscellaneous: Music is heavy in this anime. Just watch out for the fact that the music fills in more of the "choir" genre, but even if that's not your thing, I guarantee you'll enjoy it anyways given that you're relatively open-minded with music. There are a couple of things I didn't understand, and that would be the characters' questionable common sense. When you finally catch the bad guy, why do you sing to him? If your dad made an embarrassing bento, why don't you just mix the rice so the message is unreadable to the people sitting next to you? I suppose that kind of logic is prevalent in other animes and their strange common sense isn't as bad as in other shows I've seen, but these are things I'd at least expect the characters to overcome without going too over-the-top. Animation is high-quality, and it's evident right away that this show strives to keep away from the common antics of a comedy. Despite being a 2D depiction of five high school students, it was one of the most realistic, if not the most realistic anime I've watched so far. It's not far off from reality with its depiction of real places and the faces don't portray exaggerated expressions at that. Overall: For some strange reason, whatever that may be, I ended up enjoying this anime more than I previously thought I would. I didn't think I would like it, given this may be just another musical and I originally watched it to kill time, but I'd be lying if I said this anime didn't make me smile or tear up at the right moments. I don't like it as much as certain other anime series that I've seen, and I do admit I have a lot to rant on for this anime,yet I can't find a good reason why I like it anyways, let alone a reason why I want to watch it again. With that said, for those looking to watch this anime, here's my advice: to those of you who like tearjerkers, you might cry a bit at the end (I admit, I teared up). To those of you who can't get enough slices of life, I recommend that you watch this anime. To those of you who want an uplifting "feelgood" anime, definitely hit the play button and start watching. Even if you're like me and just need something to kill time, watch the first couple of episodes, and from there, allow the show's charismatic elements to sink in and carry you the rest of the way through. I think you'll enjoy it, given that you're not one of those people who thinks an anime without action or fan service is a terrible anime. I'm more into action, and gory stuff when it comes to anime. But this just blew my mind. The music is great, animation is fantastic and has a great story. No blood, no fighting, no violence whatsoever. It's something that'll probably leave you tearing up and or feel really cheerful. Anime like this encourage me to look for something different other than the usual violent stuff. 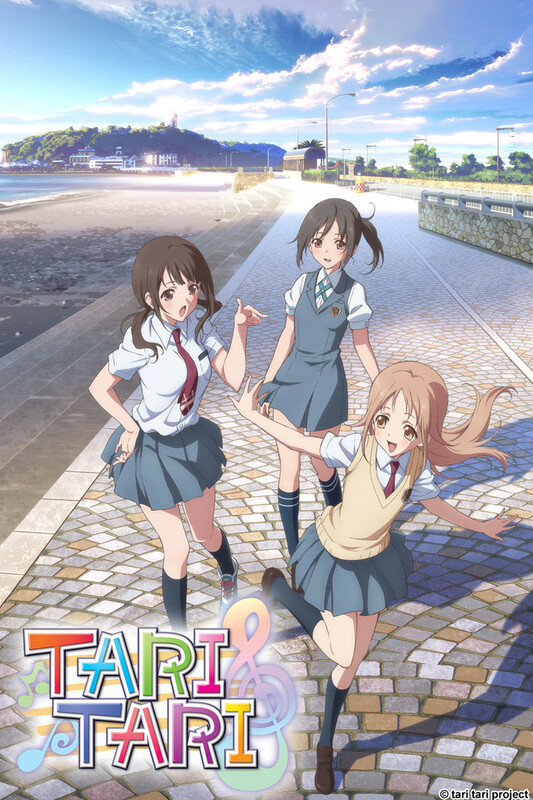 If you're looking for something more relaxing and emotional, Tari Tari would be the best choice. Good and its all about music! This is definitely a must watch for any music lovers. And even for those who aren't, this anime has much to offer. The animation itself if beautiful. The movements are fluid and it is just amazing in quality. Hands down one of the best looking animes of the year if you ask me. The characters had depth and were very believable. Watching their individual struggles was crushing at moments, but seeing how they were each others support system was heart warming and endearing. The music was definitely a 10/10. I find myself humming many of the melodies while doing work or surfing the web. I was surprised that music from an anime would have so much drive. All in all an absolute pleasure to watch. Entertaining as hell and really uplifting. High school. Ya, we've all been there (or at least most people have). Some people likes it, some people are indifferent about it, and some people hates it with a passion. The times we spent at high school may be a different experience for everyone but it is because of these experiences that we learn more about friendship, life, and most importantly, about ourselves. This series explores the life of what a final year of high school in the minds of several friends in the “Choir and sometimes Badminton Club” as they prepare their journey of their adulthood and into the future. Tari Tari is one of those unexpected series of the season. In one way, there's not much action or excitement watching a bunch of cute girls doing cute things. In another way, it's a lighthearted school drama that details a story driven by friendship between a group of students who have their dreams, goals, ambitions, and mostly importantly, each other. That's right, Tari Tari is the rare gem of this season and one you can't buy into your heads without embracing its styles and themes that brings to its viewers. The series is relatively new that is adapted from the manga written by Evergreen. Tari Tari is tagged with music, slice of life, as well as school life so guess what, the series takes place at a school setting. Some of you might feel less enthusiastic about a series regarding to school life. After all, we got like a million of those already and who needs more. Yet, Tari Tari here presents a sweet tale of music melancholy that has a charming cast and a refreshing drama that is memorable. There are five main characters in the series that all debuts in its pilot episode. Count them with a hand. Five characters and all of them have identical shaped heads but different personalities. First up, we got Wakana Sakai. She is what I would call the stubborn young lady. Despite having a strong voice with real talent, she refuses to sing. However, after certain circumstances, Wakana learns more about the true values of family and dedicates herself for the mother that she loves so dearly. Then, we got Sawa Okita who wishes to turn her dream of becoming a professional jockey into a reality. She's what I can see as probably the Yamato Nadeshiko of the club. Yet, below that outer shell hides an intensity that has vibes which can invoke much drama. Finally, we got Konatsu Miyamoto who makes up the balance of the group and seems to be the cheerful type of girl who likes to get involved with others but truly wants to help her friends. These three girls here all spice things up in the series with their conflicting personalities and ideologies. The boys in the series are also noticeable at different stances. They won't let the girls walk all over them especially Taichi Tanaka who wishes to expand his badminton club. He is on a level of stubbornness with Wakana but deep down has a kind heart. His best friend, Atsuhiro "Wien" Maeda is there for him even though the duo has nearly completely opposite personalities. So, here we are, the Choir and Sometimes Badminton Club. It's hard to say who is the leader as all of them have different parts in the story. They all have their dreams whether becoming a jockey, a professional tennis player, or finishing a song for a person they love. It's like high school you know, especially during the senior year when you start wondering about your future. P.A Works (Angel Beats!, True Tears, Hanasaku Iroha) is involved in the series. Thus, you can expect some similarities if you're familiar with the studio. Hanasaku Iroha is especially the case here considering the various similarities and that slice of life nostologia. The visuals of the series is also similar that brings simple school life artwork to life. Some of the episodes are deeply colored but overall retains that simple yet realistic image that gives off the slice of life feeling. There are times some childish yet cute animation sequences with miniature version of some of the characters. Overall though, the artwork visuals are above average. The overall soundtrack coordination and music in the series brings out a general lighthearted melody in the series. Jin Aketagawa (Hatsukoi Limited, Honey and Clover, Toradora!) presents his skills into Tari Tari with his experiences involving school life melancholy. The OP song "Dreamer" by AiRI is a symbolic term that reflects what people can do when they try hard and with the help of their friends, can make dreams come true. The ED songs here though are much more interesting to look at. In the first few sequences, there's not much development with only a lonely girl (Konatsu). As the episodes progresses and as the club grows, the ED songs features more ensembles with the cast. The fact that the series is also tagged as “music”, you can expect some talented tunes beating into your ears. Unfortunately from my respective, I can't really agree with such a real talent coming out the mouths of the characters. It's just fairly average but with their ambitions, the club can make it quite far. Later on though, they bring more amusement into the show and their inner hero awakens within them bringing forth more drama. Speaking of which, there is definitely drama in the series despite not being explicit detailed. Drama takes place into the eyes of the vice principal who has a grudging attitude. It reminds me of this guy I met during high school. He would berate students for the tiniest of mistakes and hands out detention slips like free samples at Costco. Yet, as the series progresses, we can see some reflection of the vice principal's past and what she's been through. Although not the most likable character in the series, it's interesting to see her development involving the members of the cast. Ultimately, this series is a rare gem of this season that takes slice of life to a different level. It is a school drama with a likeable cast of characters of different personalities. They bring forth joy, entertainment, drama, but at times also emotions that we all feel as part of being human. The series artwork has realism and is natural like the way a high school experience should be. The soundtrack orchestrated fits within the lighthearted mood of a typical slice of life series. The story itself focuses on the individual characters as well as the Choir and Sometimes Badminton Club as a whole. It's dramatic and entertaining to watch even though. Still though, don't expect much surprise as the series does follow with some cliches and can be repetitive at times. Additionally, the series has many borrowed themes from other school life series so don't expect the unexpected. So, what do you think? Still want to watch Tari Tari? I know high school has a different view in the minds of different people but it's an experience that most of us have or will explore in our lives. During that final year, it's time to think about the future and with friends as well as a strong ambition, there's nothing we can't accomplish. Thank goodness it didn't turn into a moe/fanservice show. The backgrounds and level of detail were amazing. I really loved the characters and their development through their histories and their interactions. Only Konatsu seemed to need a little bit more story to her. How the vice-principal fit into everything ended up being a very nice story as well. All in all the music was good, the animation was great, and I'm hoping Sentai will be putting this on a Blu-ray to show off everything. Anime is just an average splice of life, i don't really find it funny but it does have a nice atmosphere to it. When watching this anime i don't really laugh or cry but it does have its moments sometimes. This anime just makes you feel happy. This was a really light, fun anime. Great characters with very unique personalities. I loved it and the music in it is fantastic. It makes for an easy watch with problems that make you care about the characters, but do not take over the story. Please give Tari Tari a chance, I dont think you will be disappointed. I was looking through my Crunchyroll queue for things I had skipped over the Summer because I had to focus so much on school (among other things) and therefore had no time to watch it serially each week. Some things I plan to shelve and say "never mind, I'll have to skip it for the next round of Fall stuff" or have it sit on my on-hold list for an indefinite amount of time. That's when I came across Tari Tari, and thought I might have to do that to this one. It's a typical school genre anime about kids who want to follow their dreams at a very crucial point of their lives while having to deal with typical teenage problems. Sounds like a Disney movie, right? I suppose Tari Tari started out that way, but I was actually somewhat glad that I sat through its entirety. Why would I enjoy something that clearly wasn't very original? I suppose it's because it made me feel like I related to the problems of forming and maintaining the status and reputation of a school club. I am the president of my college's Anime Club after all, and we're planning a big event for the Fall term. Tari Tari is about 5 high school students who decide to form a Choir Club despite the fact that the Choral Club is already in full force. As you can imagine, each of the five members have their own motives from the git-go, especially when it comes down to putting a musician, a diva, a jockey, a foreigner, and a badminton player together in one room for the purpose of singing. This obviously leads to those typical teenage problems I was talking about earlier: anorexia, student politics, and lack of interest or direction, to name a few. And yet I feel pretty much the same way when it comes to organizing my club activities because the interest level and motives of my club members are extremely diverse. That doesn't mean, of course, that we can't possibly find common ground to get something going; otherwise my club wouldn't exist! The main conflict, however, arises about halfway into the series when the Choir Club (and sometimes Badminton Club) hit a road block because the school's Cultural Festival is being cancelled for reconstruction of the school. Yes, due to the growing Japanese problem of a declining birth rate, the school board has decided to dismantle the school and build (ironically) an apartment complex in its place. While everyone from the school's administration to the student council are quite depressed by this situation, the five brave students decide to continue on with their performance in order to sing their original work one last time. I won't give away the ending, but rest assured, I felt something very heartwarming about this series. Again, maybe I'm a little biased, but I felt that this series touched upon my own personal experience. It goes to prove what I like to do as a school club president and ultimately supports an education industry that I would like to take part in. After all, it seems that even in America we are totally focused on business and standards in the education system that we forget about the passion and joy we have when we put in the effort for doing the things we love. This is a theme I would love to teach to the next generation of students because I believe that finding that direction in your life is extremely important at the adolescent and young adult ages. So yes, this series, as cliche as it might look on the surface, comes highly recommended by me personally. Heck, I might even consider it one of the anime series that truly highlights my own life!